Outdoor Photographer is written by the world’s leading landscape, wildlife, sports and travel photographers. Every issue features advice on improving your photography, evaluations of the latest equipment and stunning images. Outdoor Photographer’s breathtaking photography looks better than ever on the Kindle. 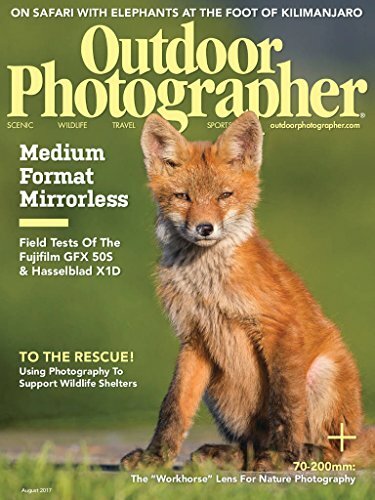 Kindle Magazines are fully downloaded onto your Kindle so you can read them even when you’re not wirelessly connected.Outdoor Photographer magazine is a dependable source of information and inspiration for the outdoor photographer. You’ll find it full of advice on everything from choosing the right equipment to making the most of a full-time or part-time career as a photographer who specializes in outdoor shots. The magazine offers features and regular columns including equipment reviews, reader submissions, and coverage of the work of top and up-and-coming professional nature photographers. Outdoor Photographer magazine brings you articles about exotic and not-so-exotic locales that are ideal for you as an amateur or professional outdoor photographic artist. You’ll find breathtaking photographs that may just inspire you to follow in the footsteps of contributors who have taken trips to Antarctica, Hawaii, Alaska, and other locations far off the beaten path to photograph the beauty of the great outdoors. When it comes to equipment reviews, Outdoor Photographer magazine concentrates on the right products, from filters and tripods to lenses and camera bodies, that are best suited for the challenges of photographing outdoors. You’ll find suggestions and advice on how to get the most out of your present camera, as well as how to choose new basic and advanced equipment and accessories. Even if you’re just deciding whether you want to get into nature photography as a hobby, you will find the product reviews and instructions in this magazine to be helpful and interesting. Subscribe to Outdoor Photography magazine for a wealth of information and advice that you’ll enjoy and value whether you are a beginning or advanced outdoor photographer.